This baked version of Mac and Cheese gets its cheesiness from 1) a noochy sauce 2) a tofu ricotta-like mixture 3) Vegan Cream Cheese 4) Daiya or other shredded vegan cheese, and 5) Walnut Parmesan Sprinkles. Yep, that's five! To make the sauce, melt butter in a small pot over medium high heat. Stir in creamer, nutritional yeast, garlic powder, onion powder, and paprika. Bring to a boil. Reduce heat and stir in flour. Whisk vigorously until thickened and no lumps appear. Remove from heat and set aside. Transfer mixture to a 9×13-inch (23 x 33-cm) baking dish. Sprinkle an even layer of Walnut Parmesan Sprinkles all over the top. Make these and store them in a shaker jar to sprinkle on pasta, pizza, salads, or anywhere you'd sprinkle on some grated parmesan. Maybe you've heard that a book that Celine and I wrote in 2011 titled Hearty Vegan Meals for Monster Appetites, was re-released this year with a new name and a snazzy new cover! Now, that book is known as Home-Cooked Vegan Comfort Food. (Please know that if you already own Hearty Vegan, there is no need to buy Home-Cooked Vegan Comfort Food, as they are literally the same book.) The giveaway below is for a copy of the original Hearty Vegan...there are a limited amount of copies left with the original cover. Who knows, they might just become collector's items. Ha! Thank you for a giveaway! My favorite mac n cheese recipe is actually one that I came up for MoFo one year. http://newmanimproved.blogspot.com/2010/11/gluten-free-and-vegan-mac-n-cheeze.html Looking forward to trying this one!! Wow, another giveaway. How awesome of you. That recipe for the five-cheese mac looks amazing. I will have to try it next time I have a chance to have vegan cream cheese on hand. My favorite mac n' cheese recipe for the last year has been an adapted version of Chloe Coscarelli's baked mac recipe, from Chloe's Kitchen. So easy and delicious. Fantastic Mac! Love this book! Cheddar Daiya, all the way! From the Forks over Knives cookbook. I have been vegan for over a year. Still haven't found a mac & cheese that I'm totally satisfied with, though this recipe looks outrageous! I haven't found a fave recipe yet, I'm hoping this is the one! This looks good though I'm not that overkeen on 'pretend' cheese (I wasn't overkeen on dairy when I was veggie, so lack of cheese doesn't bother me). Nice! Thanks for sharing this recipe! I just read a glowing review of this Mac n Cheese over at jojo's blog! I looks totally amazing! Never tried vegan mac n cheese but SO SO SO excited to try it! Thanks for this! I like nut-based cheese sauces or a plant-milk based white sauce, either way, I always add miso for umami! Thanks for another giveaway, Joni! My favorite recipe uses a mix of Daiya and Follow Your Heart cheddar cheeses. And shells, of course. Shells are perfect for capturing all that cheesy goodness. I still don't have a favorite mac & cheese. This could be it, though. I'm going to try this soon! Would love to win the book - I heard great reviews! My favourite is the VegNews. I always go back to it! And I need this cookbook - my husband is a thin vegan dude who has an endless appetite! Appetite for Reduction Mac and Trees. 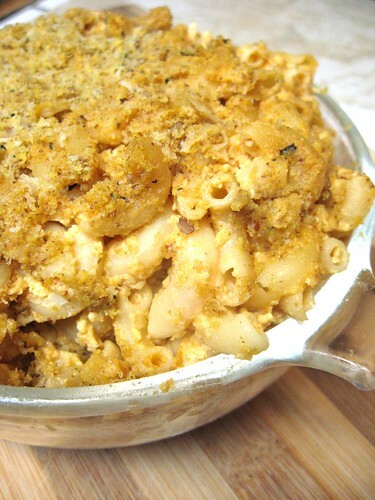 My favorite mac currently is this random recipe that I found on VegWeb four or five years ago. It's actually not very good, and I have a feeling this five cheese baked mac will soon be my new favorite! I don't have a favorite vegan mac and cheese recipe. I have about 5 vegan mac recipes I filter through regularly. Right now, my favourite uses Dreena Burton's Vegveeta dipping sauce for the sauce. Then bake with a crispy topping. Include broccoli, and it's the best. Yummo! I am planning on making a mac n cheese this yer during MoFo, I might have to switch to this version! And I featured your Masa Masala burgers yesterday, loved 'em! I love mac & cheese but don't really have a favorite! I love a mac and cheese heavy on the nooch and tang. Hands-down favourite is the Mac Daddy from Veganomicon. A classic. Depends on my mood, for quick and decadent, I like the New Farm mac n cheese and for a creamy and easy, I like veganmenu.blogspot.com's recipe. My favorite Mac is Isa's Mac N Shews with cashews & sauerkraut. So different, but so good! My favorite recipe is my own! Uses Daiya, Tofutti sour cream, no-chicken broth, sriracha and spices. Simple, but perfect! Oh man! That sounds decadent and rich. I'll need to try it! Aren't shells the best? I love the idea of using coconut oil. Cool! Thanks for the feature! Miso makes me so happy. Sorry, that was really bad. Haha. Daiya and follow your heart? Whoa. That is some serious cheesy goodness. i have never tried to make mac and cheeze! i need this cookbook! I actually haven't found a good recipe yet, to be honest. Last year I became obsessed with the butternut mac n cheese sauce from Oh She Glows, except I would use a can of pumpkin puree to make it super easy. I've never really cared for baked mac and cheese but I had this book out of the library before and I love it. I have only been vegan since April and I have not had vegan mac yet. I was surprised at how easy veg mac n' cheese turned out to be. I've still only made the recipe from vcon but yours looks awesome. I must try it soon. I still love the original book title better. My favorite mac n cheese recipe is the one from Appetite for Reduction. My favorite mac n cheese recipe is the one from Appetite for Reduction. Though I will be trying this next!! Mac o geez by Dreena Burton! I haven't tried any yet but I look forward to trying a healthy whole foods one that isn't too high in fat. That Mac looks amazing! I would love to win your book! Thanks! I have not made vegan mac yet but I am looking for a great recipe!